A total of 7 records matched your search. 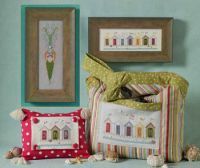 January from The Cricket Collection is shown stitched on 28count Water Lily or a fabric of your choice with a stitch count of 294w x 65h using DMC/Anchor floss. 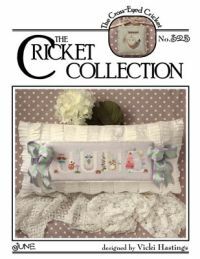 June from Cross Eyed Cricket Collection is stitched on 30 count Antique Hydrangea from R & R Reproductions, or fabric of your choice with a stitch count of 184w x 49h using DMC/Anchor floss. La Mer from Cross Eyed Cricket is stitched on 14/28 China Pearl or a comparable fabric of choice. The stitch count is 35w x127h Mer Carrot using DMC or Anchor floss, and for Salty Neighbors a stitch count of 119w x 58h stitched on 30ct Fog from Picture This Plus or a comparable fabric, also uses DMC or Anchor floss. 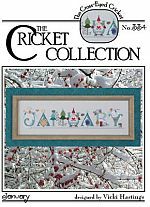 March from Cross Eyed Cricket Collection is stitched on 14/28 count Dusty Green with a stitch count of 248w x56h using DMC/Anchor floss. A Just Another Button pack is available. 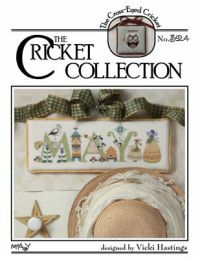 May from Cross Eyed Cricket Collection is stitched on 14/28 count Antique White with a stitch count of 176w x 54h using DMC/Anchor floss. Three Gables from Cross-Eyed Cricket is stitched on 30 count Butternut by R&R linen or 28 count Autumn Leaf, a 14 count comparable fabric may be used with a stitch count of 126w x 136h using 5 Weeks Dye Works floss and DMC or Anchor floss. A button pack from Just Another Button Company is available. 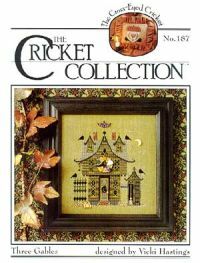 Winter from Crossed Eye Cricket is stitched on 30 count Morning Fog from R&R Reproductions, a 14 or 28 count comparable fabric may be used with a stitch count of 249w x 55h using 1 Kreinik Metallic Blending Filament and DMC or Anchor floss.